Genomic testing is being incorporated into almost all areas of medicine. There is evidence, however, that many physicians do not understand single-gene testing, let alone genomic analysis. Pathologists, given their background in molecular diagnostics and experience directing clinical laboratories, must play a major role in translating genomic technology to patient care. 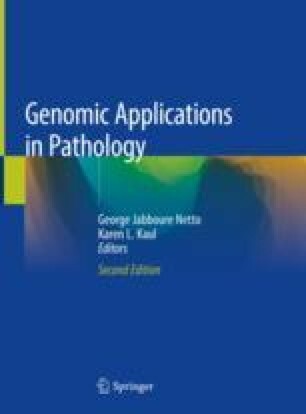 This chapter reviews the significant progress that the pathology community has made in genomic medicine training. This work was supported by the National Institutes of Health (1R25CA168544). National Human Genome Research Institute. The human genome project completion: Frequently asked questions. 2017. https://www.genome.gov/11006943.%20accessed%205%20feb%202013/. Accessed 6-1-2017. Counsyl. Family Prep Screen. 2017. https://www.counsyl.com/services/family-prep-screen/2017. Accessed 6-2-2017. Sequenom. MaterniT 21 Plus. 2017. https://www.sequenom.com/tests/reproductive-health/maternit21-plus. Accessed 6-2-2017. Bio-IT. German Teams, BGI and Life Technologies Identify Deadly European E.coli Strain. 2017. http://www.bio-itworld.com/news/06/02/2011/German-teams-BGI-Life-Technologies-Identify-E-coli-strain.html. Accessed 6-2-2017. G2C2. G2C2 Genetics/Genomics Competency Center. 2017. http://genomicseducation.net/. Accessed 6-2-2017. Hyland KM, Dasgupta S, Garber KB, Gold J-A, Toriello H, Weissbecker K, et al. APHMG Medical School Core Curriculum in Genetics. 2017. http://media.wix.com/ugd/3a7b87_7064376a9eb346cfa1b85bc2f137c48f.pdf. Accessed 6-2-2017. MacArthur D. Sample swaps at 23andMe: a cautionary tale. 2017. https://www.wired.com/2010/06/sample-swaps-at-23andme-a-cautionary-tale/6-7-2010. Accessed 6-2-2017. National Society of Genetic Counselors. 2017. Who are genetic counselors? http://www.nsgc.org/page/whoaregcs. Accessed 6-12-2017. Intersociety Council for Pathology Information. Career Opportunities in Pathology. 2017. http://www.pathologytraining.org/trainees/documents/recruit.ppt. Accessed 6-02-2017. Accreditation Council for Graduate Medical Education. ACGME Program Requirements for Graduate Medical Education in Anatomic Pathology and Clinical Pathology. 2017. https://www.acgme.org/Portals/0/PFAssets/ProgramRequirements/300_pathology_2016.pdf. Accessed 6-2-2017. Accrediation Council for Graduate Medical Education, American Board of Pathology. The Pathology Milestone Project. 2017. http://www.acgme.org/Portals/0/PDFs/Milestones/PathologyMilestones.pdf. Accessed 6-2-2017. Training Residents in Genomics (TRIG) Working Group. Training Residents in Genomics (TRIG) Website. 2017. http://pathologylearning.org/trig. Accessed 6-2-2017. American Board of Pathology. Taking an examination: Primary examinations. 2017. http://www.abpath.org/index.php/taking-an-examination/primary-certificate-requirements. Accessed 10-13-2017.